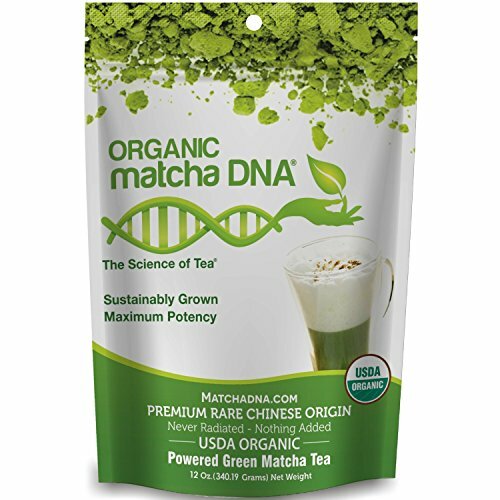 100% USDA ORGANIC MatchaDNA powdered green tea is a delicious tea with a delicate and naturally good taste. MatchaDNA is organically and sustainably grown in the pristine mountains of the Fujian province and is hand-picked. It can be made as tea, lattes, smoothies or used in foods and cooking. Few people know that the current practice of drinking powdered tea in the Japanese tea ceremony is actually from the Song dynasty in China. It dates back to over 1,000 years ago. This practice was carried on in Japan and is now considered a pillar of Japanese culture. MONEY BACK GUARANTEE - We stand behind our products 100% and offer a 100% Money Back Guarantee. Today, once again high quality Matcha is being made in China. This tea has a slightly different character than its Japanese counterpart. Both teas have a deep green color and a thick, savory taste and texture. Both are high in EGCG and antioxidants. However, our Chinese MatchaDNA is smoother, and it has a rich, smooth and fresh taste unlike any other. Our teas are also tested in independent laboratories for Lead and heavy metals and pass the tests with flying colors! USDA ORGANIC & SWISS CERTIFIED ORGANIC TO USA AND EU STANDARDS. 100% CERTIFIED BPA FREE POUCHES. DELICIOUS AND NUTRITIOUS TEA: 12 oz Tin Can of MatchaDNA Organic Green Tea Powder is naturally packed with antioxidants, vitamins, minerals, amino acids and EGCG's. 100% USDA CERTIFIED ORGANIC - All MatchaDNA teas are USDA Certified Organic. Our farms have been inspected and meet the stringent USDA Organic rules and requirements. LAB TESTED FOR LEAD AND HEAVY METALS: Each batch is also tested for Lead and heavy metals by third party labs to ensure purity. CERTIFIED BPA-FREE PACKAGING - All MatchaDNA Matcha tea packaging is Certified BPA-FREE. We are the only Matcha tea company to package our teas in certified BPA-Free packaging. 100% SATISFACTION GUARANTEED - MatchaDNA stands behind every product it makes. We are confident that you will love our products and offer a 100 Percent Money Back Guarantee. If you have any questions about this product by MatchaDNA, contact us by completing and submitting the form below. If you are looking for a specif part number, please include it with your message.